Strategically located at the outskirts of the Central Business District along Kallang Road, the SIS offers convenient access to the city center and the Changi International Airport. Delegates can access the SIS facility via the Mass Rapid Transit (MRT) network of trains, public buses or taxis. Five minutes by taxi from the city centre. Various taxi pick up and drop off points are located at the roundabout along Stadium Road, outside the Administration Office via Stadium Crescent at Car Park E.
The SIS is easily accessible via public buses. The nearest bus stops are located along Stadium Walk and Stadium Crescent, near the East Entrance overhead bridge. Bus Service No. 16, or refer to the SBS Transit Bus Guide for more information. Stadium MRT Station is the nearest Circle Line station within walking distance to SIS. Visitors can also take a 5-minute bus ride from Kallang MRT Station via Bus Service no. 11 at the Geylang Lorong 1 Bus Terminal across Sims Avenue. Alternatively, visitors can take a 10-minute walk from Kallang MRT Station. Refer to the SMRT Travel Guide for more information. A total of 4,372 outdoor carpark lots are available in the vicinity of the SIS, to serve visitors who choose to drive to the stadium. 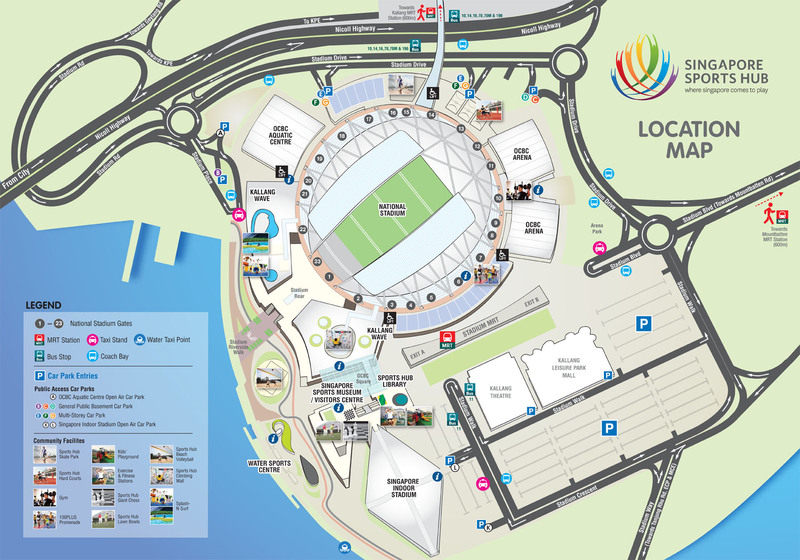 Car Parks D, E and F are accessible from Stadium Road, Stadium Crescent and Stadium Walk. Car park charges are based on the URA coupon parking system.